The HoMedics Triple Shiatsu Cushion with Heat offers a spa like massage without leaving the comfort of your home. The 3D Full Contour Technology that most closely mirrors an authentic Shiatsu massage. Get the full massage experience from the deep kneading shiatsu nodes that move up and down, across, and inward and outward. The heating feature offers added comfort and relaxation. The HoMedics Triple Shiatsu massage cushion is lightweight and can be easily strapped to a wide range of chairs. The convenient remote lets you switch between directions, add or take off the heat and fits nicely into the side pocket attached to the cushion. This would make the ultimate holiday gift this year for anyone looking to de-stress and relax for a few minutes a day. 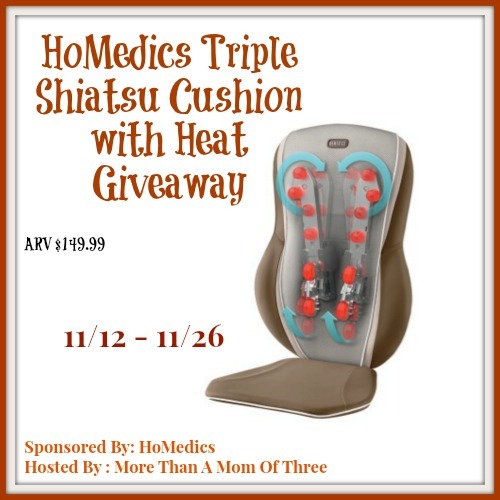 One lucky winner will receive the HoMedics Triple Shiatsu Cushion with Heat a $149.99 value! I love the massaging nodes travel up and down your back for a deep kneading shiatsu massage. I like: massaging nodes travel up and down your back for a deep kneading shiatsu massage. I think that would be the deep kneading shiatsu massage feature. You can get a massage without anyone’s help. The heat is my favorite. This would be awesome as I just found I have a hip problem and have to start therapy. I like the heat and the fact that the HoMedics is very lightweight.